Italian painter, one of the leading artists of his day in northern Italy. 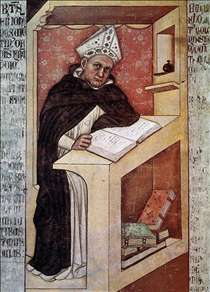 His earthy, humane, and naturalistic style is well seen in his series of frescos of famous Dominicans (signed and dated 1352) in the Chapter House of S. Niccol in Treviso. The saintly figures are shown meditating, writing, and reading (the first dated example of spectacles being worn appears here) and Tommaso shows a remarkable ability to depict intellectual activity. His reputation was such that work was commissioned from him by the emperor Charles IV in Bohemia, and two panels by Tommaso are still in Karlstein Castle, near Prague. It is unlikely that he visited Bohemia, but there is some kinship between his work and that of his leading Bohemian contemporary, Master Theoderic. See more details about "Cardinal Nicholas of Rouen"
See more details about "Saint Albert the Great"